Nova Scotia lies on the East Coast of Canada, and makes up what is known as the "Maritimes", also including New Brunswick and Prince Edward Island. It's main city, Halifax, has a long and vibrant history, resulting in a varied selection of good food and good drink options to be found. The Maritimes are probably most well-known for the seafood, however we found there to be so much more on offer than just seafood. We had just over 2 days in Halifax, so were time limited. However, we still managed to squeeze in a taste of the local flavours. We found Chain Yard Cidery after a quick Google search of places to eat within walking distance from where we were staying. It peaked our interest on-line, and in person, it did not disappoint. The decor is urban, rustic, and chilled out. Dimmed lights and a glowing red neon sign gave the place a night time glow well-paired with good food and alcohol. We were seated and served extremely well by the waiter; the service was excellent. Food - We chose a few small plates to share and it was all REALLY good. The kitchen was pretty small, so it was impressive with how quickly the food came out and at a high quality. Drinks - We chose 2 flights: one had four Chain Yard ciders, and the other had four local "guest" ciders. The presentation was unique, and the names were written under each small glass, which was great, because we knew what we were drinking and didn't have to try memorise what the server told us. There was a good variety of flavours in each flight, and it was customisable, so you could choose the ciders that interested you to try. We had researched this brewery back in B.C before embarking on our trip, and it was on our list of places to try while in Halifax. It also happened to be not far from where we were staying (I guess everything was..? Halifax isn't huge). They specialise in beverages, but they have paired up with local food places who will come and cook in the corner of the bar to offer things to eat as well. We just had beer this time, but the food and menu looked good. As it was Winter, inside was humming, but we managed to find seating. We can imagine some evenings getting pretty busy, but in warmer months, they have a great outdoor area, which would spread people out a bit. They also had a shop on-site where you could buy Drinks and Merchandise to take home. The decor was cool, and we're always interested to see different and unique ways to display flights; here they came in a muffin tray which was pretty inventive and deserved a mention. "All you can Eat" Coconut IPA - we really liked it, and it wasn't all just talk; it actually had a coconut flavour. Delicious. El Espinazo del Diablo - with Lime and Jalapeno; some zest and heat. Like the coconut IPA, it really did taste like it said it might and the flavours were well-balanced. Recommendation: try this last if in a flight, as the warmth from the Jalapeno can linger and affect your taste of the others! Dave and Morley 4.0 - this was a coffee brown, and of course we will try almost anything with coffee in it. The taste was deep and dark, and the rich coffee flavour came through well. It was almost like drinking a cold brew. 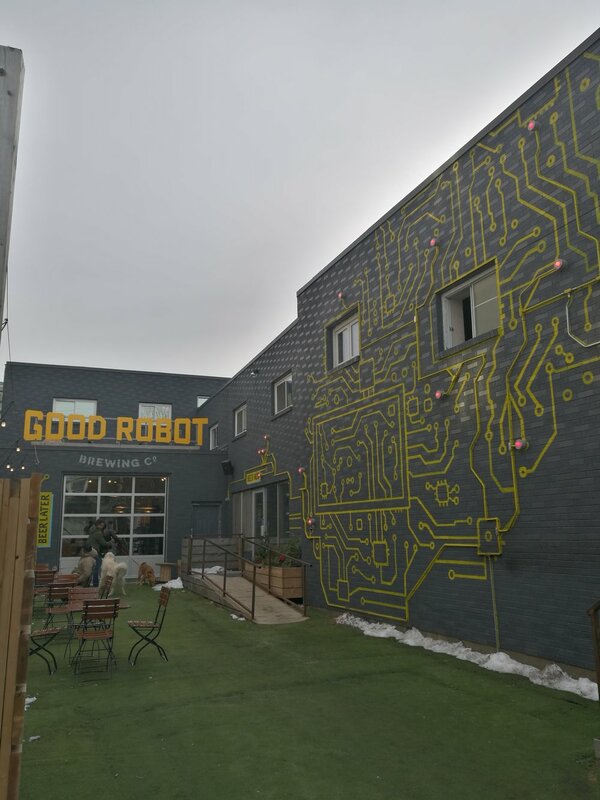 After trying out the some local beer at Good Robot, we wandered to our next spot. We were ready for some food, and possibly a few more beverages, as it was Wednesday Tiki Night at Studio East. The place was cosy, and decorated accordingly. We were seated quickly, and right next to the Tiki bar, which allowed us a Front row seat to watch the bar tender at work. We ordered some unique cocktails, and after perusing the menu, chose some food to share. The staff were charismatic and friendly. The kitchen and bar wasn't huge, but they really worked their space and it seemed to be running like a well-oiled machine. Drinks - For Tiki Wednesday, the bartenders create 3 feature cocktails. The 2 we chose were the "Cinnamon Girl" and the "Sleeping Giant". Now, we don't have a good recollection of what exactly was in them, but we do remember that they tasted amazing! They were fresh, full-of-flavour and the display and garnishes were excellent. Food - Calamari Pakora + Dumpwing + Ricebowl with Pork Belly. The food was excellent. Particularly the Ricebowl, which had extremely tender pork belly, and some amazing house-made kimchi. On our way out of Halifax, we stopped in Dartmouth to check out a coffee shop (more about that here). While there, we stumbled across our last foodie stop before heading to our next destination. Yeahyeahs offers New York style Pizza sold by the slice, and by the pie. A few choices of flavour kept it nice and simple. The decor was also simple, but stylish. A slice of cheese and mushroom + a slice of pepperoni. Both flavours tasted really good, and there was a good ratio of toppings, cheese and base. They weren't too greasy, and we liked that the flavours were kept simple, but they still had ample flavour and taste. Overall, we enjoyed getting a brief taste of Nova Scotia. As we travelled in Winter, there were a few places and areas closed for the season, so although it was good to go when there weren't too many tourists around and the hotel prices were a little lower, it would be good to go back to sample more in the warmer seasons. As for seafood, we didn't end up having a lot of it in Nova Scotia, but later on in our Maritime travels we did eventually get to taste some. You can read more about that soon. Any other local food places in Nova Scotia that you think are worth a visit? Let us know!